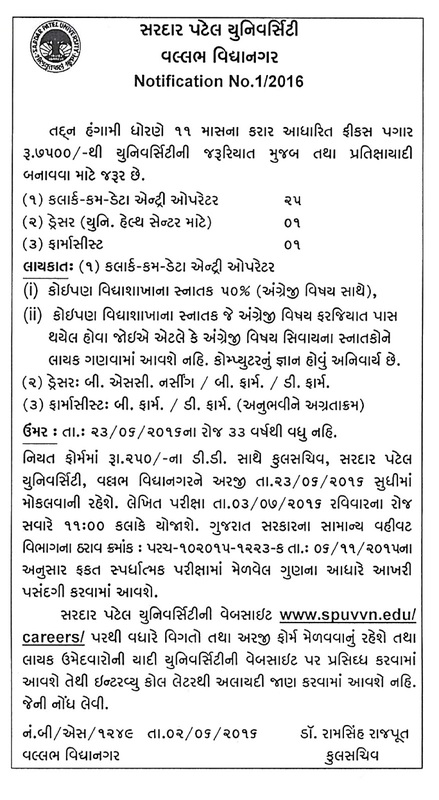 Sardar Patel University Vallabh Vidhyanagar (SPUVV) has published a Advertisement for below mentioned Posts 2016. Any graduate with 50% (with English compulsory), Computer knowledge. B.Sc. Nursing / B.Pharm/ D.pharm. Age Limit : Not more than 33 years as on 23-06-2016. Application Fees : Rs. 250 /- DD in the name of Registrar, Sardar patel university, Vallabh Vidhyanagar.